time: start – 7:30 a.m. ; finish – 2:30 p.m.
We set off early this morning. It was 7:30 when we pushed off from our Too Small Island campsite. We were happy to be on a very calm Ottawa River with little wind to ruffle things up. Ahead of us (as seen in the pic below) was the railway bridge. The question mark of the day was the portage around the Chats Falls Generating Station. We did keep our eyes open for potential campsites on the islands we passed on the Quebec side of the river but most had a sign indicating their status as protected areas. 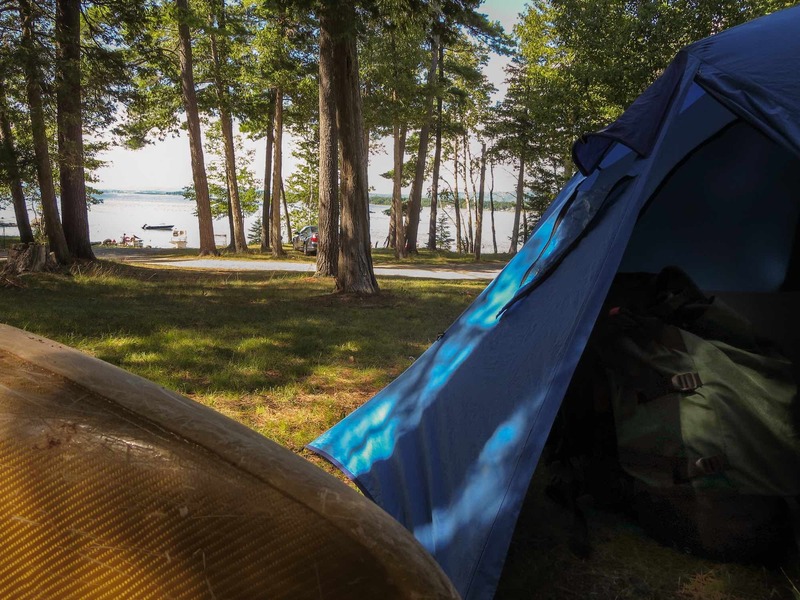 We realized that our previous night’s island campsite had been a lucky find since nothing we paddled by this morning came close to providing a decent flat space for our four-person tent. 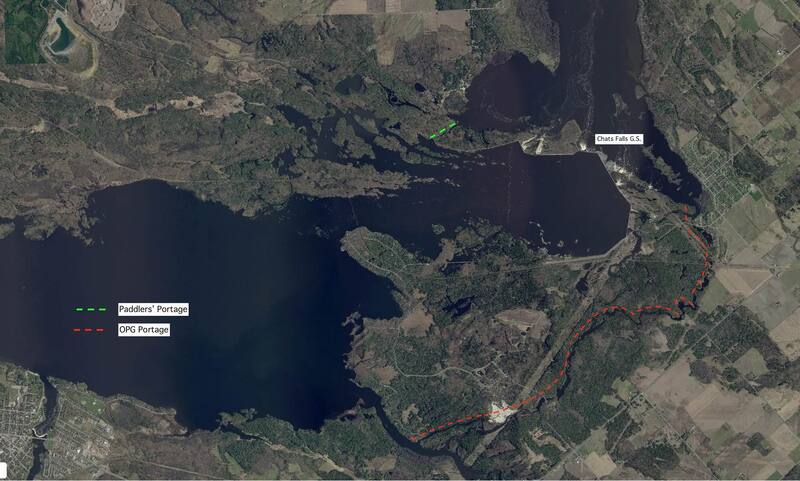 As the topo below shows there is another camping option – nearby Fitzroy Provincial Park on the Ontario side below the generating station and just across from Pontiac Bay. However, it would have added another ten kilometers to our previous day’s paddle. It raised the water level of the Ottawa river above the dam and the Chats Rapids immediately above the falls as well as others disappeared with the rising water level. Today this section of the river is a long lake – Lac des Chats – which stretches from Chats Falls G.S. all the way upriver to Portage Du Fort. It destroyed a major natural wonder which regularly brought boatloads of tourists up the Ottawa from Aylmer, Quebec to see the dramatic 35′ (11 m) drop at Chats Falls and the many other different chutes stretching across the river. 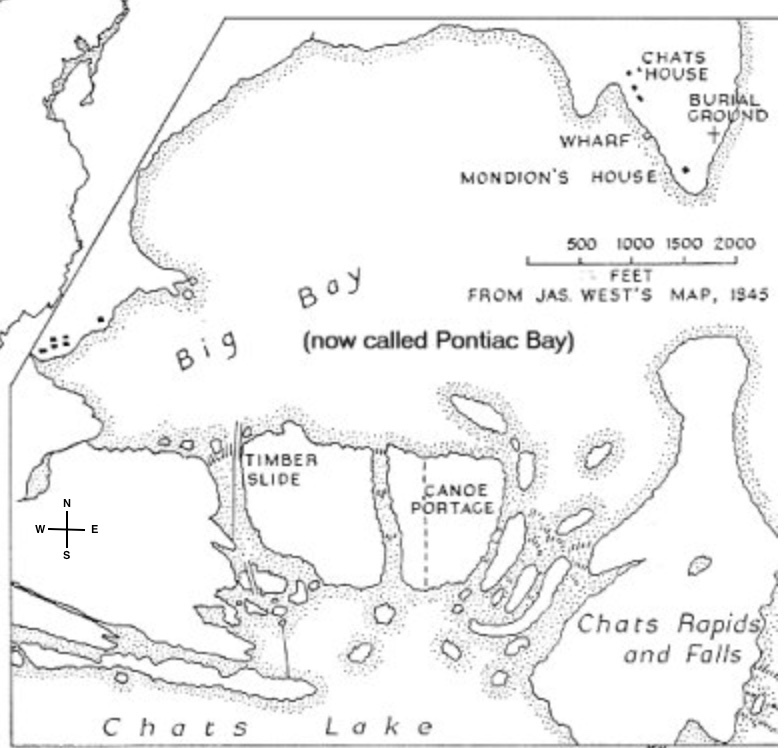 The timber slide indicated on the map above had been constructed in 1835; on the island to the east of it was a portage trail, a leftover from the fur trade era. Some fifteen years later construction started on a canal to the west of the timber slide (the extreme left on the map above). Its purpose was to allow easy boat navigation around the falls. It would also replace the horse railway which from 1847 carried freight and people from Pontiac Bay to above the falls. 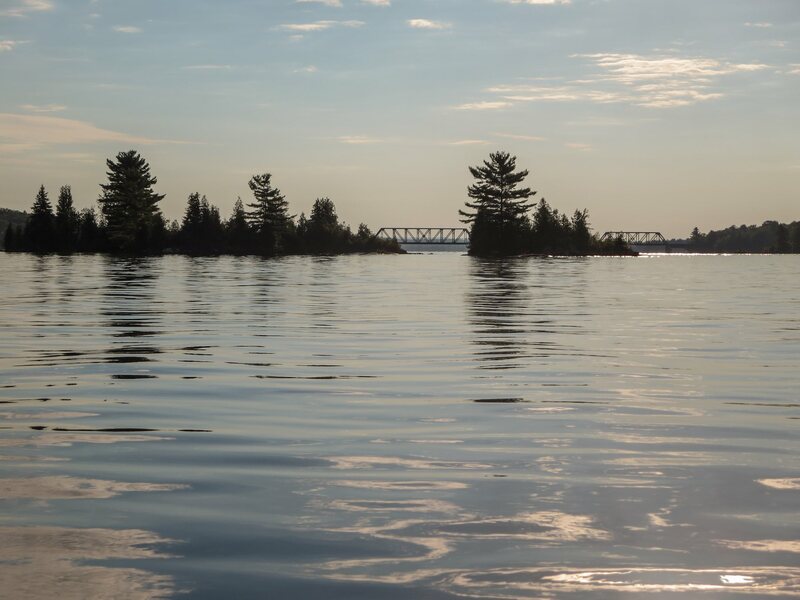 Seeing the string of islands across the river helps make sense of visitors’ awestruck descriptions of the many individual chutes and falls of one of the most dramatic sections of the Ottawa River. 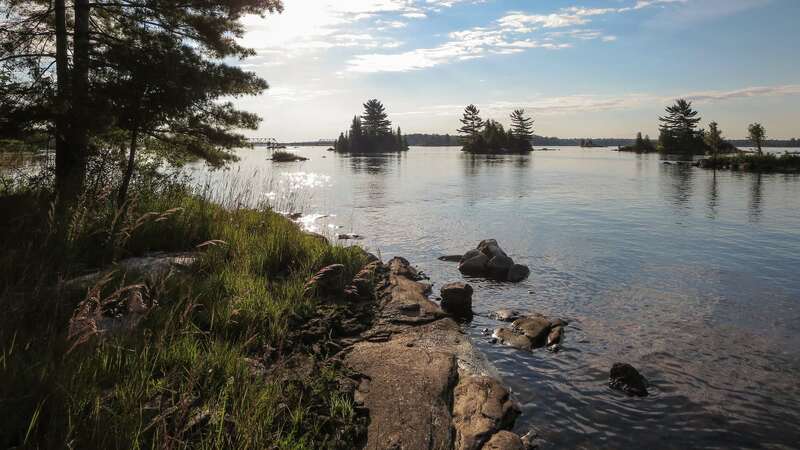 The Anishinaabe (the Algoumequins as Champlain called them) whose river the Kichi Sibi was would have known this area well and approached it with caution and respect. official OPG instructions on how to get around Chats Falls – the instructions start from down river and take you to the top. See the end of the post for the web source of the information. 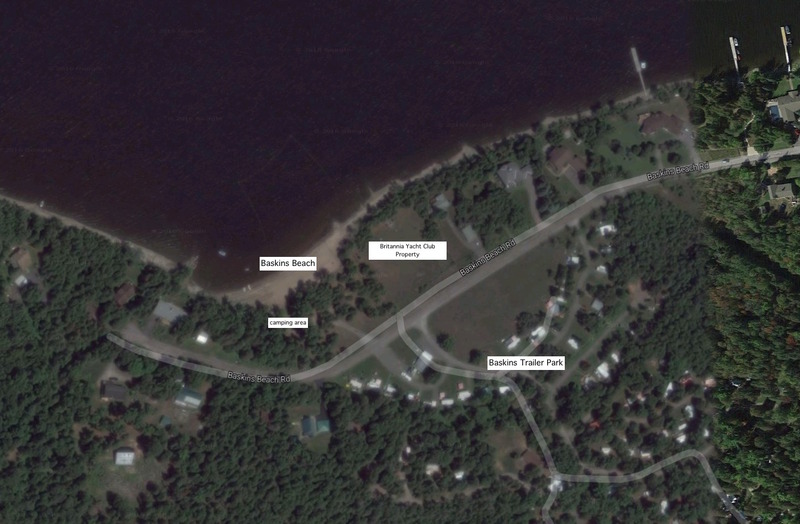 I scan the Quebec shoreline for the old portage trail, the one the voyageurs used, but know that even if I find it, the far end is cut off by the dam. I get out and bushwhack my way next to an old canal that’s overgrown with trees. The thought of portaging through the tangle is too much so I find a road on the Ottawa side, five miles to get around a dam, but it’s all I got. Note: this paddler came at the portage trail from below the dam and was headed above, as the official OPG description above describes. 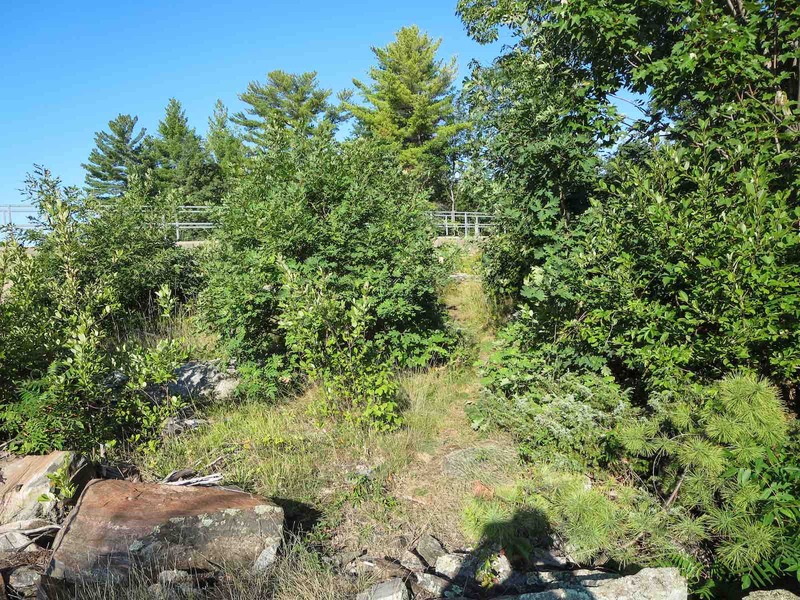 So close to the actual portage trail – and yet he returned to the Ontario side! Bad choice! Let’s hope no one else repeats his experience. 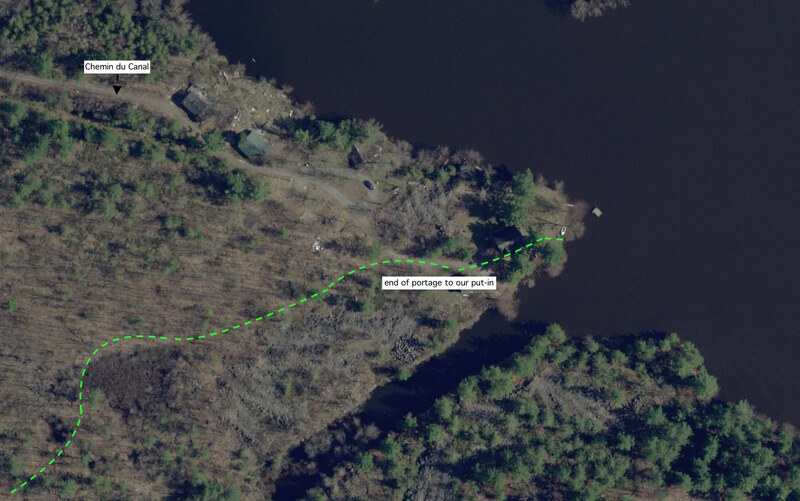 The portage that he was looking for is a bit under 600 meters in length and is on the west side of the canal, the topo feature called “Le Vieux Canal” already mentioned above. One great thing about this portage option is that it lives up to the OPG “stay clear, stay safe” motto and poses absolutely no danger to paddlers. It’s also nice that it’s eight kilometers shorter! Luckily, after I had googled my way to the above negative experience, I found this kayaker’s more positive one from 2005 – (JOURNEY 51: “A DAM GOOD TIME!“). It made “Le Vieux Canal” portage sound do-able! 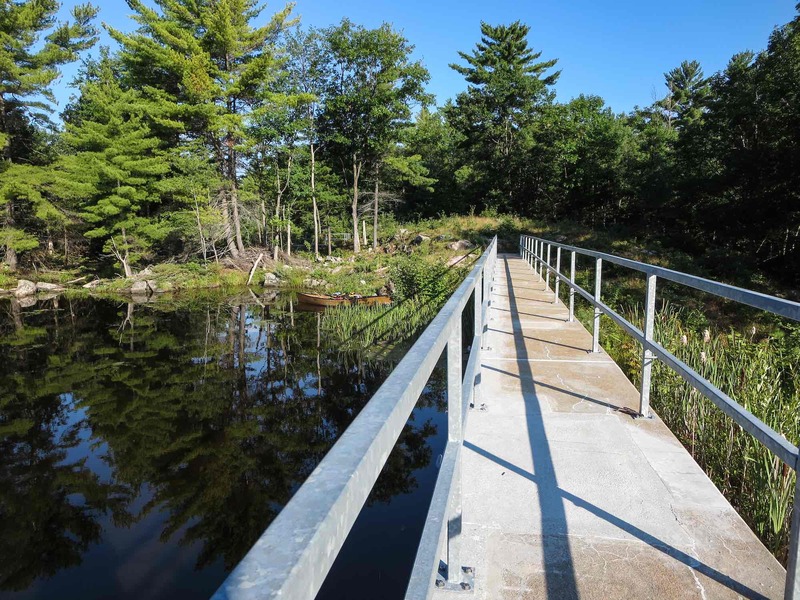 We paddled up the north side of Baie Black until we came to the concrete wall whose top walkway is pictured below and paddled to the far end. We still didn’t know exactly what we would find – or if we would even find it at all! The trail begins with a short walk back down the wall on the other side. 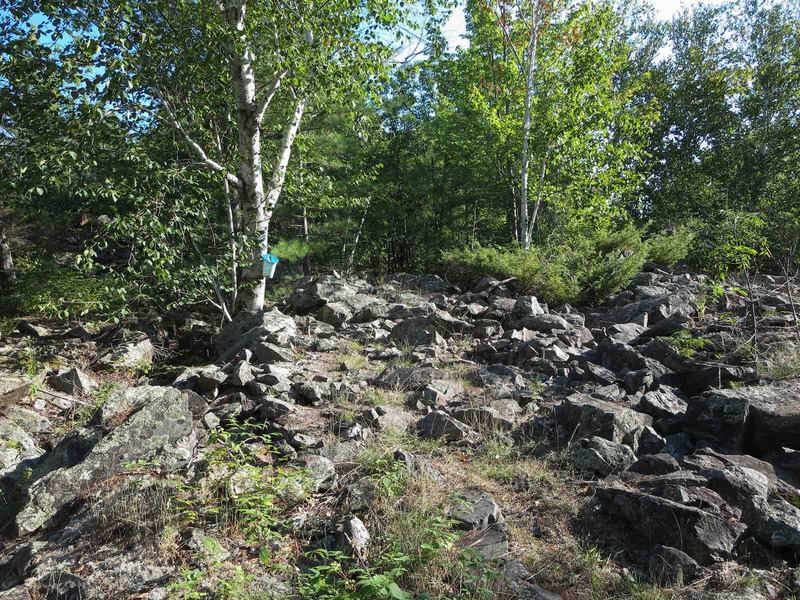 Behind the wall is a stretch of broken rock and rubble which eventually leads to a flat and typical woodlands portage trail which follows the direction of “le Vieux Canal” all the way to Pontiac Bay about 600 meters away. The trail is clearly well-used and is easy to follow. Off the road that the trail comes to (it is called Chemin du Canal on the maps) are a number of cottages/homes. looking back at the start of the trail leading down from the concrete wall at Le Vieux Canal near Chats Falls G.S. looking down at the start of the trail leading down from the concrete wall at Le Vieux Canal near Chats Falls G.S. 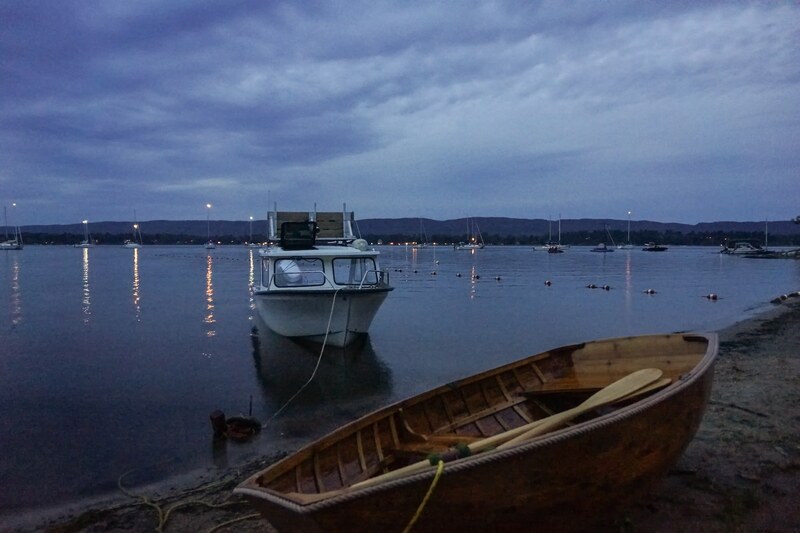 We got to the take-out point at 8:45; by 9:20 we were paddling in Pontiac Bay. One issue of concern: When we got to the Chemin du Canal at the far end of the portage we ended up walking down to the water through someone’s property. (It may well have been the folks mentioned in the above trip report.) The green broken line is a rough approximation of the last bit of the trail. Once we reached the road we followed it to the end and soon walked down to the beach. There was a car parked in front so I figured someone would be home. I rang the front doorbell a couple of times to see if it was okay to put in on what I can only assume is their beach – but no answer. I shouted up to the open screen windows on the second floor – both in front and at the back of the house – but no response. We moved the canoe and packs down to the water and finished off the portage as quickly as possible. When we got into the bay we paddled along the shore for a bit to see if there was another portage take-out/put-in. However, the water in the bay was so shallow that we gave up on the idea pretty quickly! Looking at the satellite map above it does seem possible to approach the portage trail by paddling or lining up the narrow canal channel a bit and thus avoid the two properties on the point. Some scampering over rock rubble required! Note: if you have any information about this portage – and, in particular, the Pontiac Bay end of it – which I could add to my description here I would really appreciate it. 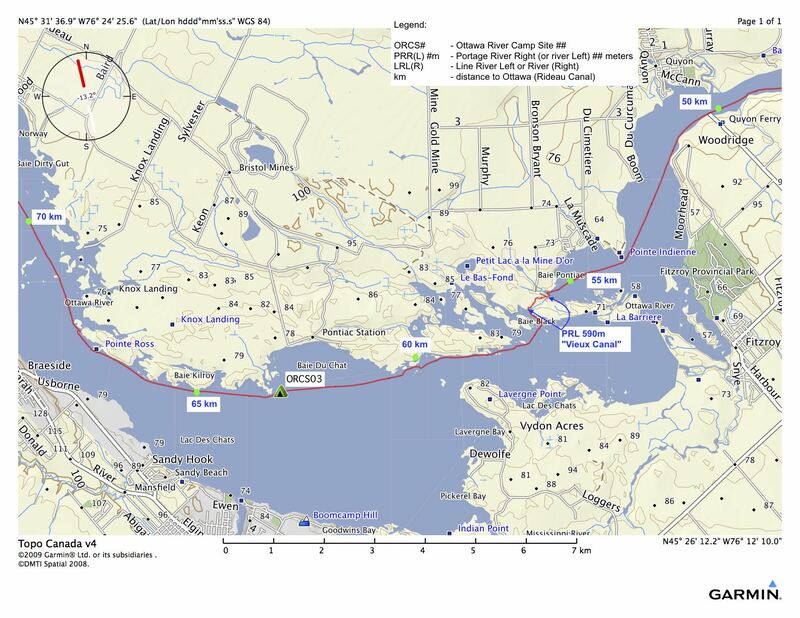 It would provide any future paddlers with the right route to take so as not to upset waterfront property owners! By 10 we were paddling north and at the beginning of the bend which takes the river past Quyon on the Quebec side. We took a last look at the Chats Falls G.S.some three kilometers behind us. In our paddle across Pontiac Bay to the Ontario side, we had also passed what looked like a resort. A bit of research on our return revealed that it was actually a Tim Horton’s summer camp for children – Camp des Voyageurs. Not clear is whether they have an actual facility for serving coffee or donuts! Maybe that is where the folks whose property we walked through at 9 a.m. were? looking back at Chats Falls G.S. A bit more digging would probably reveal more Kitchi Sibi Anishinaabe roots of Ottawa Valley place names – a wintertime project perhaps! Around 11:30 we pulled in at Crown Point for a lunch break. Given all the “private property/no entry” signs we ended up setting up our Helinox camp chairs in a patch of shade on the side of Dunrobin Road. The days of finding unclaimed land along the river we were paddling were definitely behind us! We got there around 2:30 and beached the canoe – and then walked right into a “discussion” the owner, Maureen Baskins, was having with people using the Royal Britannia Yacht Club property next door. They could not understand why they couldn’t park their boat on her private beach and set up their chairs there. (The yacht club had rented out its property to the Aylmer Sailing Club for the weekend so there were a number of boats from the Quebec side there.) It was clearly a conversation she has a dozen times a day as she explained that it was her property and for the use of those in the trailer park who paid to use it. The visitors were trying their best to give her reasons why she should make an exception for them; she was being as polite as possible in asking them to get off the property. For a few moments, she thought we were Part II of the same discussion. When she found out that we were paddlers who had stopped at the beach for the night hoping to pitch our tent in the camping area, it became a new conversation! She pointed out a number of good spots for our tent and when I pulled out my wallet for a $20. bill told me to put it away and insisted we stay for free! Another day done and another generous helping of Ottawa Valley hospitality. We set up the tent and then the camp chairs and sat back and enjoyed our good fortune. The facilities – toilets but no showers – were on the other side of the road that runs through the property, as was the fast food shack (open from 4:00 to 7:00) where we spent the $20.! The day had turned out remarkably well. Still to go – one long last day to the Rideau Canal in downtown Ottawa. Complications? There would be a few. A few days previously Jim Coffey of Esprit Rafting in Davidson way up river had given us a quick run through of the rapids we would face in the final ten kilometers of our trip down the Ottawa from Fort Coulonge. We were hoping that we have gotten all the details down correctly! Note: I downloaded the above OPG info on the OPG-recommended Chats Falls portage about six months ago but did not record the website address. Just now I spent about 15 minutes at the OPG website trying to find the page where I got the information and nothing comes up. Starting off at the home page, I clicked into a dozen or so different folders and windows – and came up empty. I may be missing something very obvious – feel free to let me know! – but surely information on portages around the generating stations could be given more prominence and perhaps its own easy-to-see folder or link? Update – I finally found it here by doing what I should have in the first place. I googled “Ontario power generation portage around chats falls”. 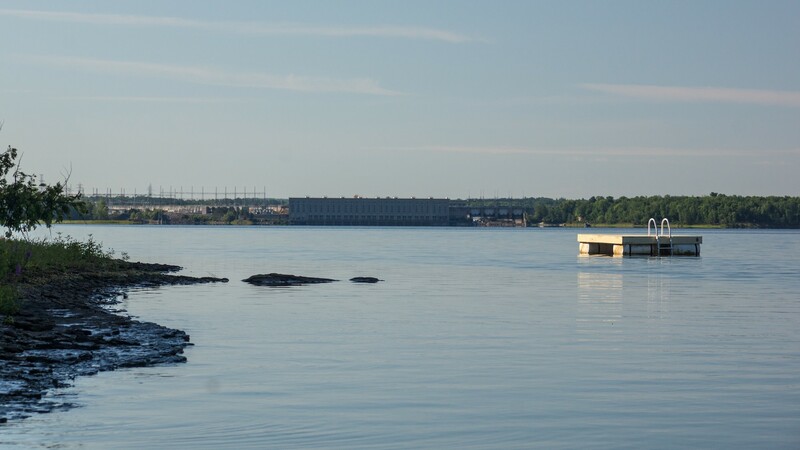 OPG needs to do a better job for paddlers using the Ottawa River. It could start by providing more accessible information on their website. It could also review the portages it recommends. 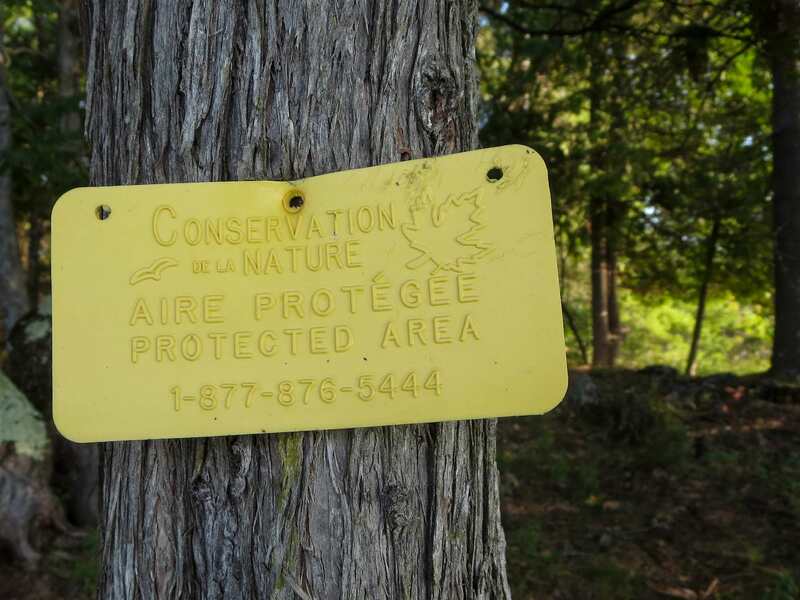 We disregarded their portage advice for both the Chenaux and the Chats Falls Generating Stations and assume that other paddlers would do the same. Since I uploaded this post, a June 2014 Ottawa Citizen column by Andrew King was brought to my attention.- “Discovering the Ottawa Valley’s lost steamship route and railway (with video)”. Had we known about the railroad and the completed section of the canal – and had we known how easy our actual portage would turn out to be – we would have checked out the various points. It has information about the rail line built in the 1840’s to get around the falls from Pontiac Bay to a dock upstream of the falls and the rapids. 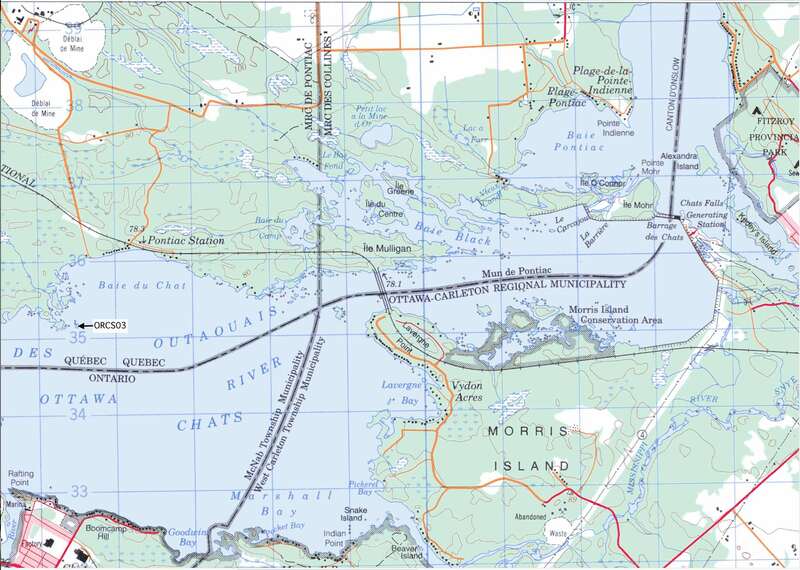 The canal project is also discussed. It turns out that we paddled right by the part of the canal project which was actually completed. 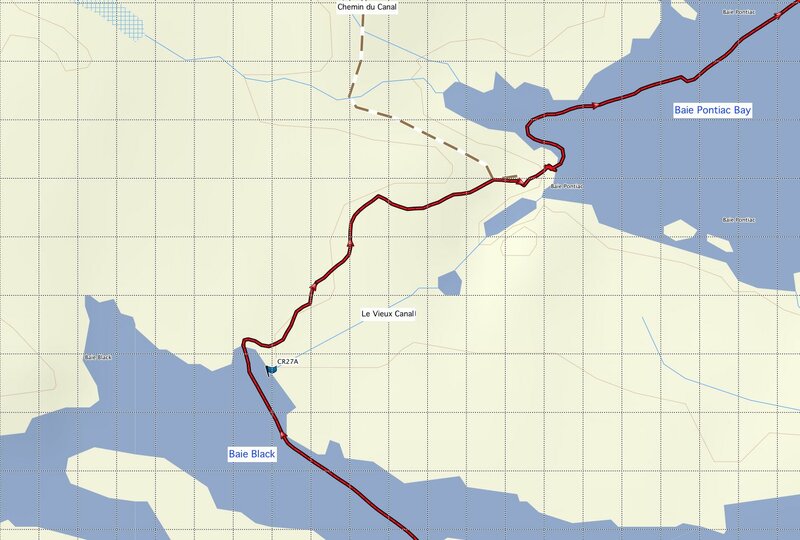 The section that is labelled “Le Vieux Canal” on the topo map and in this post, King calls “Abandoned Canal”. Here is the useful map which appears in his piece – it looks like a modern topo map which has been given that antique look. This entry was posted in wilderness canoe tripping and tagged Baie Black portage, Baskins Beach camping, Chats Falls portage, Lac des Chat camp, Le vieux canal lac des chats, OPG portage, Pontiac Bay portage, Pontiac Bay railway, portage Baie Pontiac, portage Chats Falls, portage lac des Chats. Bookmark the permalink. My kayak trip is taking me from Val-d’Or (Réservoir Descelles) to Ottawa. And your maps and knowledge of the ‘Ottawa’ are of tremendous help….many thanks (currently in Mattawa). Félicitations pour le voyage jusqu’à présent – c’est une aventure épique! C’est bien d’entendre que mon rapport de voyage était utile. L’été prochain, mon frère et moi embarquerons du lac Osisko à Noranda jusqu’au Mattawa! Je serai à la recherche de ton rapport de voyage de l’Ottawa de la bouche du Kinojevis à Mattawa! Bonne chance avec le reste du voyage!